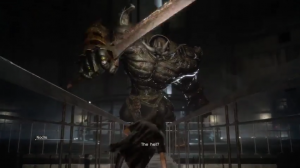 This page contains a detailed walkthrough of Chapter 13 – Redemption in Final Fantasy XV, including quests, objectives, items, enemies and bosses encountered in the game. 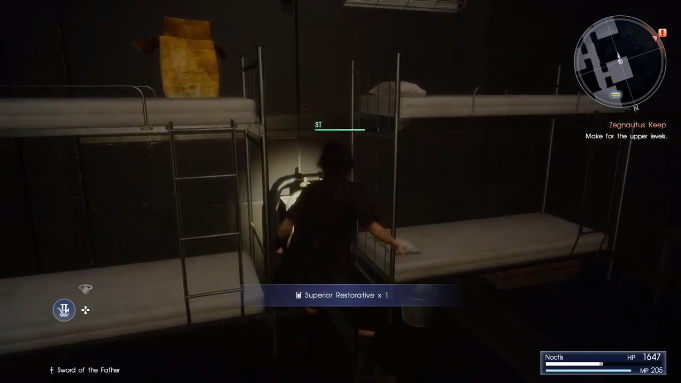 The train is invaded by several monsters, and since Noctis doesn’t have any weapons, it’s best to run away from the enemies while in the train. 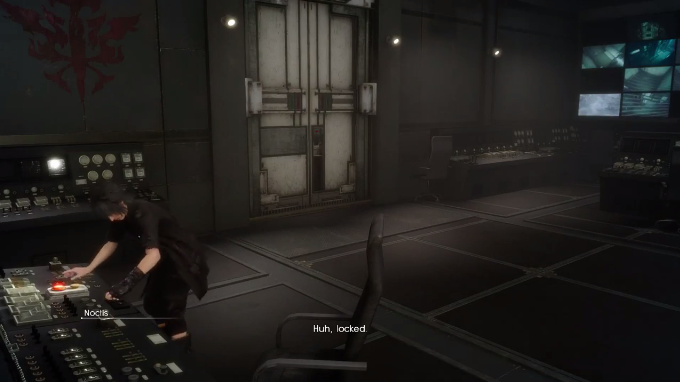 The empire is trying to close all the gates, so Noctis and friends must use the Regalia to get through the gate before it closes. You only have two minutes to reach the gate. 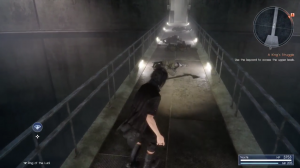 After getting through the gate, Noctis is separated from his companions. 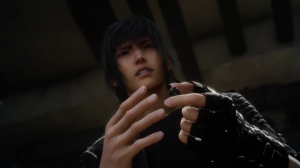 Noctis has no choice but to use the Ring of Lucis to stand a chance against the monsters. Ring of the Lucii – the ring has Death, a powerful magic that can instantly kill the enemy and restore your HP, however, the charge time will take about 5 seconds before it can evaporate a single enemy. 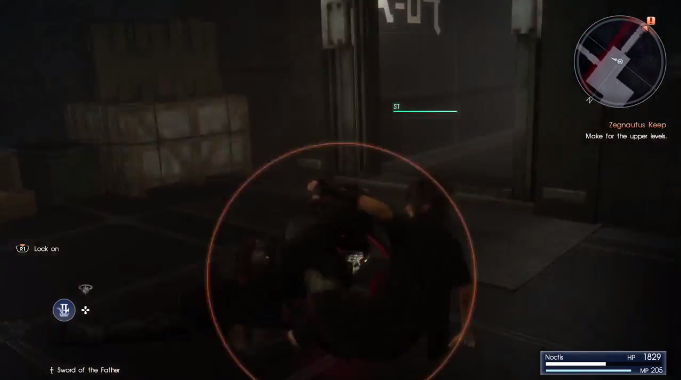 With the Ring of Lucis, Noctis now has a weapon to fight against the monsters, but since the ring has a charge time, its best to run away from monsters that you can avoid along the way. 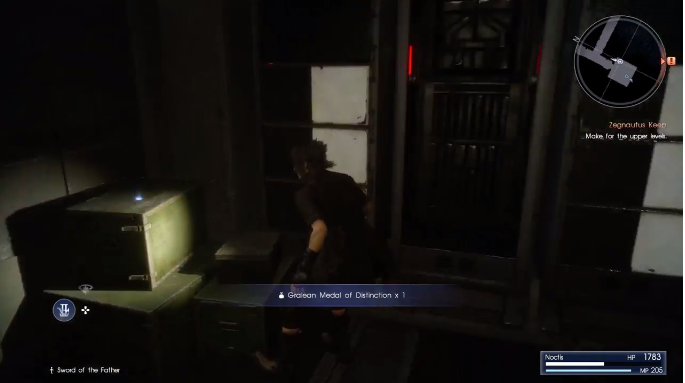 Noctis has to activate the elevator in order to get to Zegnautus Keep. In the first path, reach the quest marker to activate the control panel. After activate, you have to find a door that has a green light in its panel. The door is located at the back of the path, the site where you first used the ring, it is behind the wooden boxes to the right. Open the door and move forward. Once you’ve reach a large room, activate another control panel at the end of it. There is a Flesh Fortifier to the right of the control panel. Locate the door with the blue light. Go back to the first path and head to the second door on the left. The door with the blue light is just down the hallway. 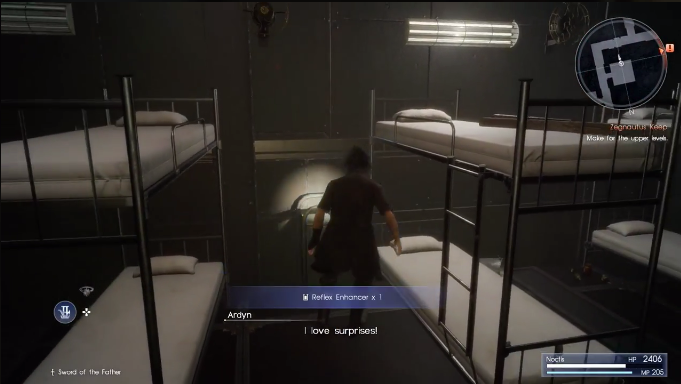 The room is a bunker that you can use so that Noctis can take a rest. After taking a rest, move forward towards the door with the green light. The magic Holy is now available for you to use, which can wipe out several nearby enemies at once. You can use this magic by holding the square button, but you can only use this magic if your MP is full. Return to the first passage, and then open the door that lead to the elevator. Ride the elevator to the upper floor. There will be imperial soldiers on the floor, and you have almost no chance of defeating them. Hide along narrow gaps in order to not be found by imperial soldiers. When you hit a crossroad, there is a room to the right that you can use to save your progress. There is also a soldier uniform where you can get a security card to access certain locked areas. leave the room and take the passage to the west and use the security card on the door. Move along the linear path until you see Prompto. Chase Prompto who headed east. Proceed to straight ahead once you reach a fork in the road, the room ahead will give your card a clearance level 2 that can access Level 2 locked doors. After this, proceed to the opposite path going north and follow the quest marker. 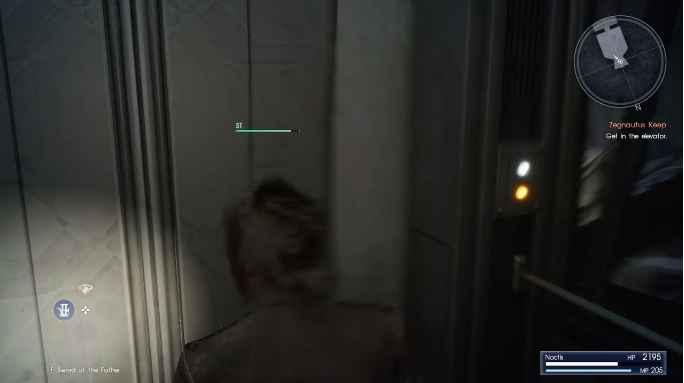 You will discover that Prompto is locked in a prison cell, head to the left path and then open the door to the right, there is a narrow gap that you can walk into to get to Prompto. There will be a battle against an Uttu, defeat the monster and proceed to rescue Prompto. 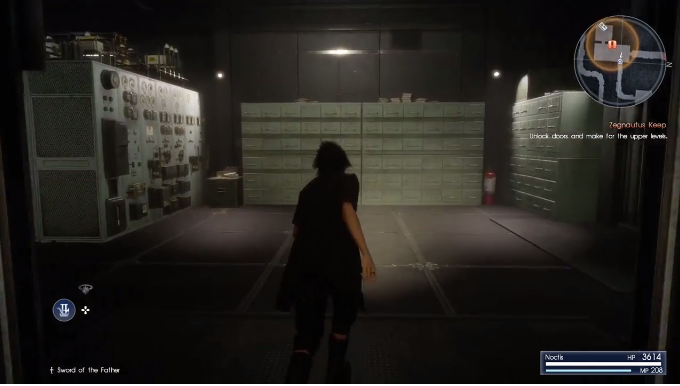 There will be another narrow gap to the left of the wooden boxes that you need to walk into to get to Prompto. 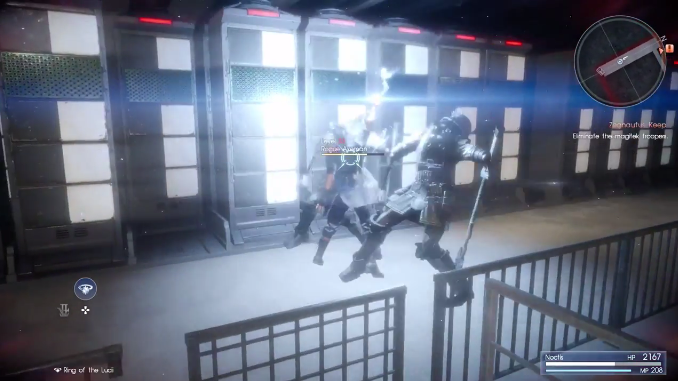 After getting to Prompto, you will find out that it is a trick and it is just an imperial soldier. There will be a card panel to the right of the door that you need to use in order to access Level 3 doors, use the panel then follow the quest marker. 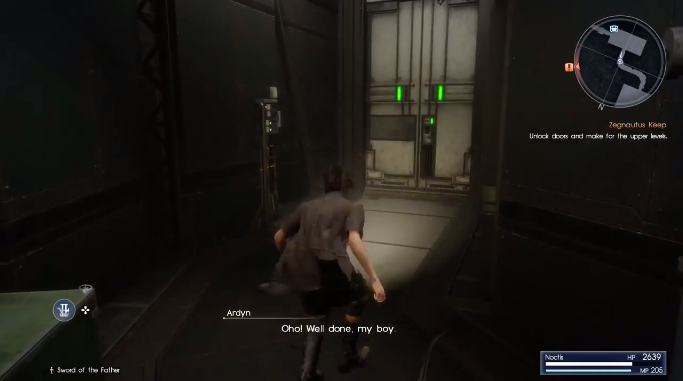 After following the quest marker, you have to activate the central elevator. Head east and search for the keycard inside the area, there is a Gargantua guarding the area but its best to avoid contact. Follow the quest marker in order to obtain the keycard. Once you find the keycard, activate the central elevator. 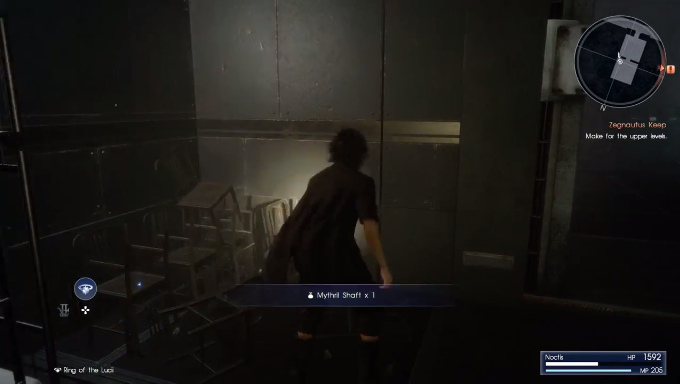 However, you will not be able to use the elevator as the Gargantua will break the floor that Noctis is standing on, ending in Noctis falling down to the lowest part of the area. 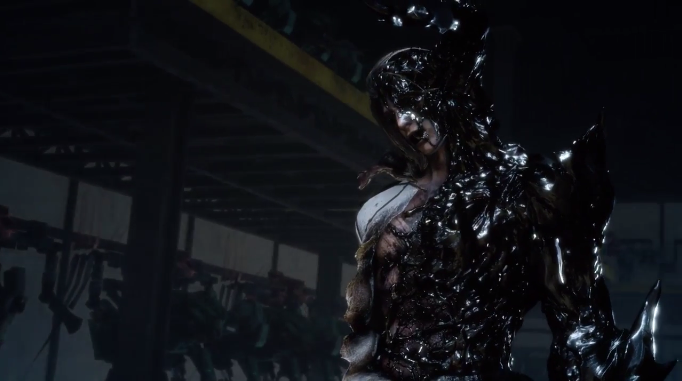 Noctis finds the dead body of Ravus, with his severed hand holding on to Regis’ sword. 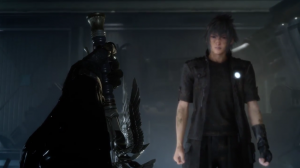 Noctis will take the sword, enabling him to use the powers of Regis’ sword and the Ring of Luci at the same time. Proceed towards the quest marker. 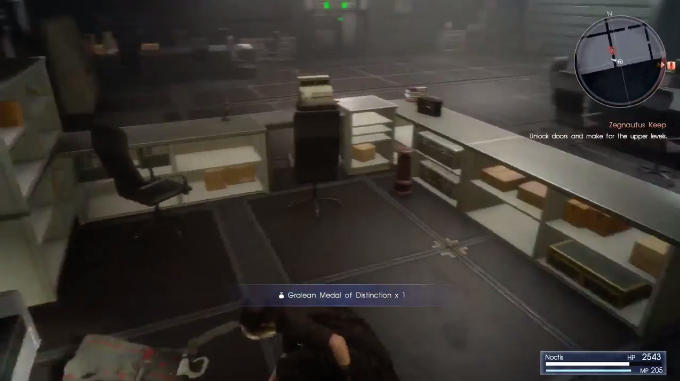 There are poison gas in some areas, which reduces Noctis’ HP. Find a way to stop the poison gas from poisoning the air. Follow the quest marker to deactivate the poison gas. After using the panel to deactivate the gas, follow the quest marker again to the west. There is a machine that you can us to upgrade your keycard to Level 4. After upgrading, proceed to the left aisle when you go out of the circular room, then return to the save point room and head to the elevator. 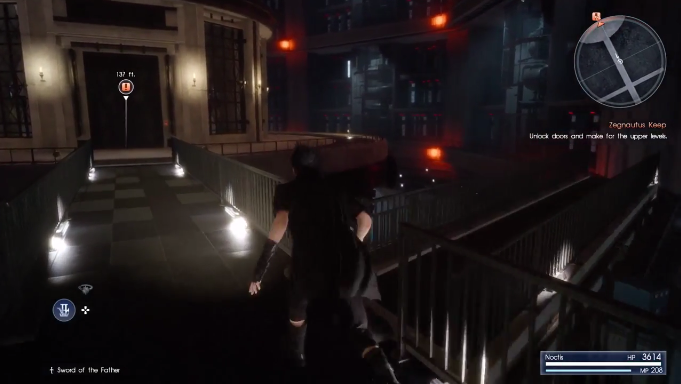 Before the elevator comes down to the floor where Noctis is in, a monster called Foras will appear behind you. You won’t be able to defeat Foras, so just try to stay alive while waiting for the elevator to come down. When it does, flee from Foras and ride the elevator. After arriving at the next floor, you will need to restore the power first. 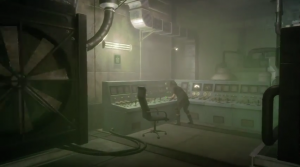 Follow the quest marker, which directs you to a control room. Here, two snagas will spawn. Proceed to take them out. On one of the crates is an Ether so be sure to grab it. After clearing the room of enemies, turn on the generator. Foras will appear again so just avoid him for now. You will also encounter Shock Troopers which self-destruct so be careful when engaging them. Exit the control room and turn right. Walk until you see a room to your left. Go inside and take the Superior Restorative. Leave the room and turn right. Keep walking until you see a room to your right. On one of the tables is a Reflex Enhancer, so be sure to take it. Leave the room and turn right. Walk until you see another room to your right. Go inside but be careful of the Shock Troopers lurking in the area. Further in the next room, you can obtain a Mythril Shaft. Now exit the room and head for the quest marker. You will eventually encounter an Uttu. 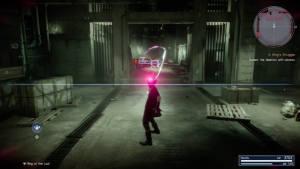 Since it moves really slowly, you can make short work of it by using the Ring of Lucis. After killing the Uttu, proceed to the gate with bars on your right and continue following the quest marker. Foras will appear again so be sure to watch out for him. You will then arrive at another control room. On the left of the room is a Gralean Medal of Distinction and on the right is a Rare Coin. Turn on the power generator. After doing this, two Rogue Axemen will awaken so be ready to engage them. After clearing the room of enemies, leave the room and take the first path to your right. You will encounter another Rogue Axeman and most likely Foras. You can choose to make a run for the quest marker or engage the Axeman. 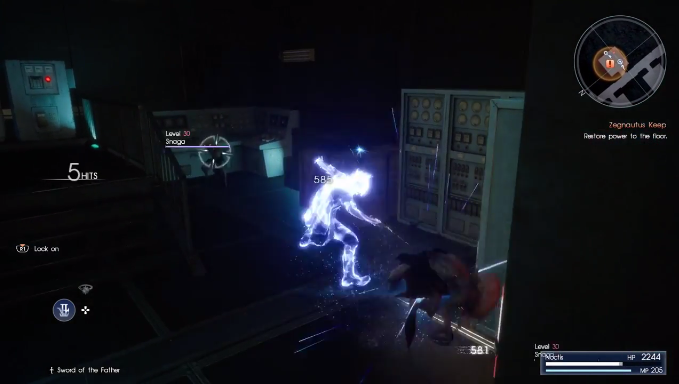 You will also encounter a Shock Trooper lying on the floor. He will grab you if you get too near so be sure to avoid him. Run up the long path of stairs. A Chrome Bit will be on top of a generator to your left before you reach the elevator. Enter the elevator and ride it to another floor. Continue following the quest marker until you enter a room with three circuit control panels (A, B and C) that each require a keycard to operate. Different combinations of active circuits unlock different sets of doors. Control panel A can be operated from the start so turn it on first. When you do, Snagas will spawn and attack you so take them out quickly. Then, proceed to the east door and enter the room. Circle the wall of the room to find a Broken Harmonica, then head to the north door. You will obtain the Panel B Keycard in this room. Head back to the main circuit control room and insert the Panel B Keycard on the middle control panel to switch it on. Then, proceed to the south door of the main control room. After entering the room, proceed to east door (or the door to the left after leaving from the main control room). Two Rogue Axemen will be in the room so prepare to engage them. After clearing the room of enemies, take the Panel C Keycard. There is also a Hi Elixir in the room so be sure to grab it. Head back to the main control room and insert the Panel C Keycard in the last control panel to turn it on. This will cause the circuit breaker to overload, turning power off on all doors. From here, first turn on control panel B and then control panel C. This will unlock all doors going to the quest marker. From the main control room, head to the west door. Upon entering the room, head to the upper right corner behind the desk to obtain a Gralean Medal of Distinction. Continue following the quest marker on your map. You will enter a room that branches out to a narrow corridor. In this room, you will be attacked by Snagas. Take them out and head for the narrow passage. 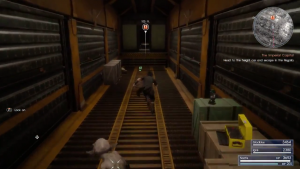 You will reach a room with an item vending machine. Stock up on healing items here if you need to then proceed to the next room. Run along the long path. You will encounter a Rogue Axeman along the way so be ready to fight. Before heading to the next door, pick up a Magitek Booster on your right. After entering the door, you can make a left and enter the Dormitorium Mercenariorum to rest up and tally your exp for free. After waking up, exit the dorm and head to the path ahead. There will be a room to your right that you can enter and obtain a Chrome Bit. Be careful through, as there will be a Rogue Axeman waiting to ambush you there. Continue following the quest marker. You’ll reach an area on the map that indicates a small room on the upper left and a path on the right. Head to the small room (you’ll find a Mega Phoenix near its door) to raise the security clearance of your keycard to level 5. There will be a Rogue Axeman here so be careful. Follow the quest marker again. Be careful of another Shock Trooper lying on the floor which may grab you. You will eventually arrive at an area with a towering structure up ahead. Proceed towards the central building. Behind it will be a switch for the platform to rise. Pulling the lever will cause all dormant magitek infrantry to awaken so prepare to plow through multiple Rogue Axemen. When you’ve cleared all the enemies, head for the quest marker. You will reach an area of where a large red circle will be indicated in your map. Go to the lower left and lower right corner of the red circle to find Muscle Stimulants. Head to the upper left corner of the red circle to find a Hi Elixir. Next, head to the upper left corner of the red circle on your map to find a Flesh Fortifier and the machine used to raise the security clearance of your card to level 6. After using the machine, you will be attacked by Rogue Axemen so be ready to engage them. Continue following the quest marker. Near the towering structure in the middle, there will be a Wraith and some Shock Troopers. Take them out and proceed towards the quest marker. You can choose to rest at the dorm again if you want to. Otherwise, continue to the quest marker. You will then arrive at a corridor with electric fences and some Shock Troopers. Take out the enemies first. Eventually, Gladio and Ignis will come to your rescue. After regrouping, continue following the quest marker. You will then come across a large control room. Head to the control panel on the upper left and operate it. This will unlock the room to east. Before heading there, head to the room on the west. You will pick up a Hi Potion and Muscle Stimulant here. Head to the conference room just ahead. Here, you will find a Bulletproof Suit. After picking up all the items, head to door to the east of the control room. Continue following the quest marker and turn left before the door to a small room. This room will contain a Shattered Timepiece and a Muscle Stimulant. Afterwards, continue to the door in the direction of the quest marker. The next room will be a large prison cell. Prompto will be just ahead. Before proceeding to him, walk to the center of the area and turn left to find an Old Book. 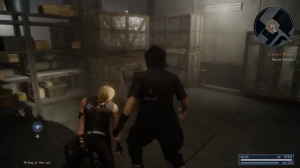 Then, head to the cell were Prompto is being kept. After a short cutscene, continue following the quest marker. 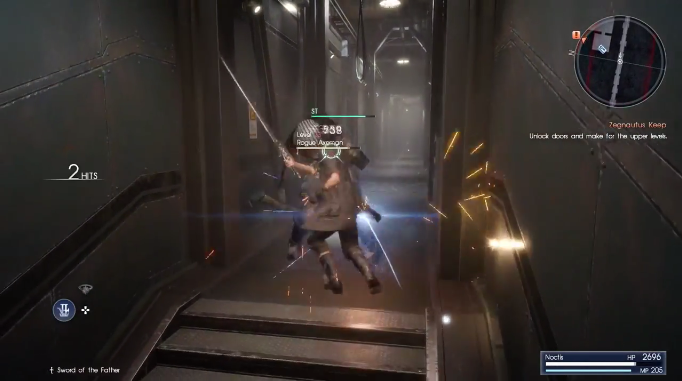 The marker will eventually lead you to the towering structure again, which is housing the device that is sealing Noctis’ powers. Prompto will unlock the gate, revealing his origins as an MT. Once inside, interact with the machine sealing your powers on the left of the room. Next, head to the hangar. Upon leaving the towering structure, you will encounter Gargantua again, accompanied by some Snagas. This time, you will need to take him out. Be sure to watch out for his Gravity magic which draws you closer to him. He will occasionally do area swipes with his sword and a ground shockwave with his fist. Keep on strafing and moving to his side until he drops to a vulnerable state. Finish him off quickly afterwards. After dealing with Gargantua, a Reaper will appear. He can be overwhelmed easily since he is alone so you shouldn’t have too much trouble with him. When you’ve finished, continue following the quest marker. Be prepared to encounter another group of Rogue Axemen on the path to the quest marker. You can also rest up at the dorm again if you need to tally exp or heal up. When you reach the big control room again, there will be more Axemen, some Snagas and a Reaper so engage them with caution. You will then reach the room with the vending machine that sells healing items. Stock up if you need to since there will be a tough boss fight ahead. Continue on to the quest marker. You will get to an area where you can absorb elemental deposits stored in containers. Head on to the hangar afterwards and you’ll be pitted against Ravus. Ravus has grown much larger in size because of the effects of the Scourge of the Stars. Keep in mind that his sword swipes and slashes have a dangerously wide range. His also likes to charge head multiple times so pay attention to where he is in the area. Use the point warps to your advantage to pop in and out of battle. He is likely to quickly wittle one or more of your allies’ HP because of the high damage from his attacks so be quick to use healing items in this fight. He can be overwhelmed to a point, which will cause him to drop on his knees. Be mindful of his AoE attack as well, indicated by dark purple energy surrounding him when he starts to charge it. 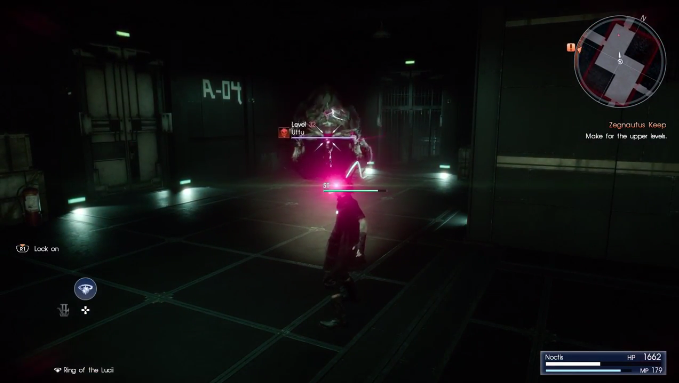 Use Armiger Chain attacks as often as you can because his defense is also quite high. After a long and drawn out battle, Ravus will fall. 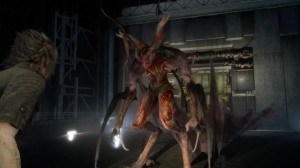 After a cutscene, more daemons will appear in the hangar. Hold out as long as you can until the elevator arrives then make a run for it. Watch the cutscene and proceed to the next chapter. 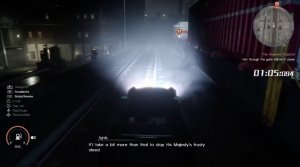 This concludes the walkthrough for Chapter 13 – Redemption of Final Fantasy XV. Не знаю как найти магазин что бы не кинули выручайте! the only words i had running through my head during this entire quest was “please god let it end.” i desperately wanted to get back in that car and go back to bounty hunting. ffs. You need to learn what North, South, East and West actually mean. Beyond that, good guide. How do you defeat Uttu? I can’t figure it out. There are two ways that you can defeat Uttu, the first is to keep your distance and cast Death against it. The second strategy is If you have full MP, you can cast Holy against Uttu. Be sure to take out the weaker enemies first since they will hinder your Death charge. Cast Holy if they are all in one corner. Hope that helps!